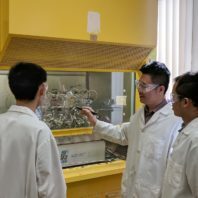 PULLMAN, Wash. – A research team led by Hongfei Lin, associate professor from Washington State University’s Gene and Linda Voiland School of Chemical Engineering and Bioengineering, has developed a novel process for synthesizing dense jet fuel from mint, pine, gumweed, eucalyptus or other plants. The research is a significant step towards making high-energy density biofuels affordable in the aviation industry. The process, known as biphasic tandem catalytic process (biTCP), synthesizes cyclic hydrocarbon compounds for jet fuel from terpenoids, the natural organic chemical compounds found in many plants. Cyclic hydrocarbons are molecular compounds with structures that can store high levels of energy. The researchers were able to create a high yield of the cyclic hydrocarbon p-menthane from eucalyptus oil. 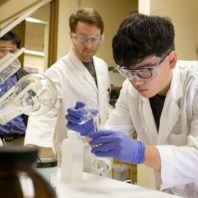 Collaborating with the University of Nevada-Reno, the researchers’ work was recently published in the journal Green Chemistry. 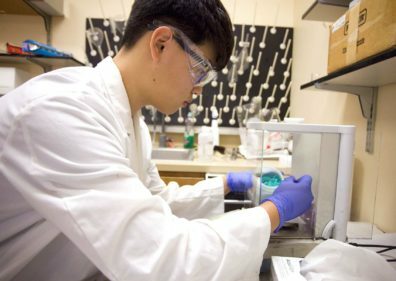 When 16-year-old Pullman High School student Hongyeoul Park began a summer research project with Washington State University chemists to investigate the efficient conversion of methane into fuel, he did so with just one uninspiring year of high school chemistry under his belt.